^ a b c d e f g h Raymond W. and Mary Lund Settle, Saddles and Spurs: The Pony Express Saga (Lincoln, Nebraska: University of Nebraska Press, 1955), 199. ^ The advertisement has been famous for generations: "Wanted. Young, skinny, wiry fellows. Not over 18. Must be expert riders. Willing to risk death daily. Orphans preferred." ^ THE STORY OF THE PONY EXPRESS, 1913, by Glen Bradley, history professor at the University of Toledo. ^ Christopher Corbett, "Orphans Preferred: The Twisted Truth and Lasting Legend of the Pony Express", Broadway Books, New York, 2003. ^ a b Visscher, William Lightfoot. 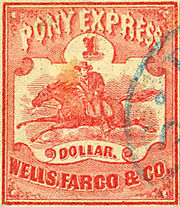 Pony Express, A Thrilling and Truthful History. Vistabooks, 1980. An authentic narrative with photographs of the Pony Express and the Old West. ^ Settle, Raymond W. and Mary Lund Settle. Saddles and Spurs: The Pony Express Saga. University of Nevada Press, 1972. ^ Stong, Phil. Horses and Americans. Frederick A. Stokes Company, New York, 1939. A history of horses in America from the arrival of the Arab Plains horses sometime around 1600, through the colonial period, taking in the Revolutionary War, Western migration and Cowboys, the Pony Express, the Civil War, the U.S. Cavalry, thoroughbred racing, and so on through the early 1930s. ^ a b Chapman, Arthur. The Pony Express: The Record of a Romantic Adventure in Business. G.P. Putnam's Sons, New York, New York, 1932. 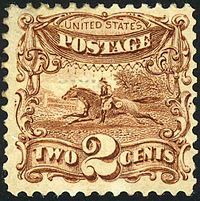 ^ Scotts United States Stamp Catalogue. 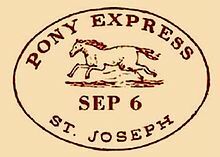 ^ "The Pony Express" Internet Movie Database. ^ "Frontier Pony Express" Internet Movie Database. ^ "Pony Post" Internet Movie Database. ^ "Plainsman and the Lady" Internet Movie Database. 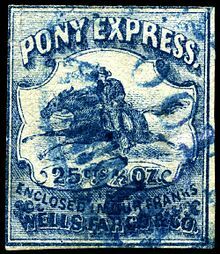 ^ "Pony Express" Internet Movie Database. 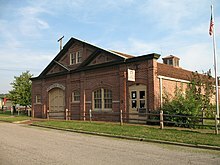 ^ "Last of the Pony Riders" Internet Movie Database. ^ "The Pony Express Rider" Internet Movie Database. ^ "The Range Rider" Internet Movie Database. ^ "Bonanza" Internet Movie Database. George A. Root and Russell K. Hickman, "Part IV-The Platte Route-Concluded. The Pony Express and Pacific Telegraph", Kansas Historical Quarterly, February, 1946, Vol. 14, No. 1, pp. 36–92. Century Magazine, New York, 1898, Vol. XXXIV. Christopher Corbett, "Orphans Preferred: The Twisted Truth and Lasting Legend of the Pony Express", Broadway Books, New York, 2003.